We Bless the Ciaccia Fritta | Sprezzatura, Y'all! The south has fried chicken. Tuscany has ciaccia fritta. It’s basically fried bread. What’s not to love, right? 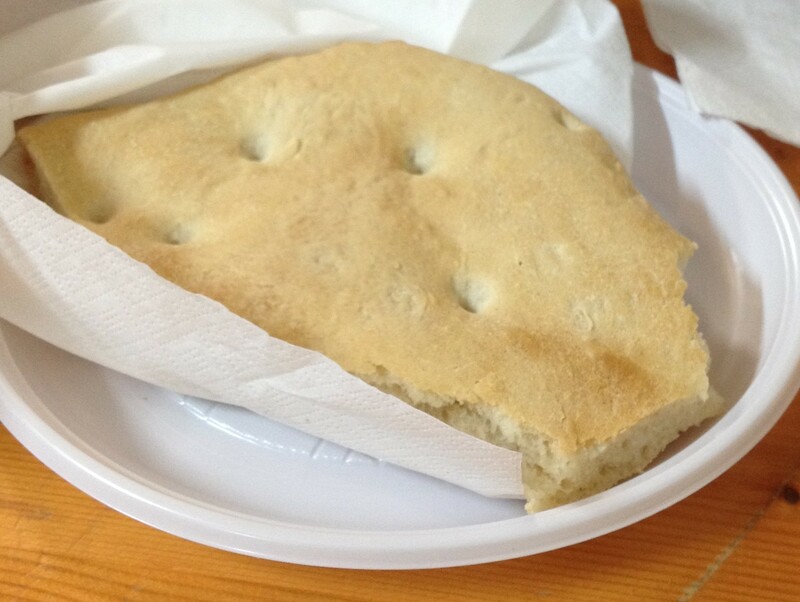 Ciaccia is a flatbread that is used for sandwiches with meat, cheese, veggies – whatever you want to stuff it with. The ciaccia is sliced and stuffed, kind of like a pita, heated and eaten. Or fried. Because everything has to be blessed, tonight the ciaccia was blessed over in Fighille. We were there. You could get the ciaccia baked or fried and stuffed with all kinds of delectable things. Because we’re in Tuscany and were at the blessing of the ciaccia, we felt we had to try it both ways. We got a baked piece just plain – not stuffed with anything. Pure unadulterated ciaccia. We also got a fried piece with proscuitto. Because if you’re going to have it fried, you should do it right. And then, because we had to make sure we had sampled all the ciaccia there was, we got a ciaccia dolce – fried ciaccia with sugar sprinkled on top. This is good stuff. Filling stuff, but good. It’s filling when it’s not fried, but frying it takes it to a new level. When it’s baked, it’s pretty dense and thick. When it’s fried, it’s puffy and crispy. You can’t not love it, but you can’t eat it very often, either. I may have had my fill of ciaccia fritta. Then again, when you go to the blessing of something, it kind of becomes part of you. Fall and then winter is coming and it may be the perfect time for more ciacca fritta. This is the kind of thing that’s so unique to this area of Italy. So we probably won’t get a chance to have it after we leave here. Sounds like I’ve talked myself into a few more servings. Yumm!! I think I just gained 5 pounds reading this! It sounds wonderful and I love the picture of them frying it in the big trough. Just wait till you get here. We’ll make sure we walk a lot to keep the pounds off!